Meninges (singular meninx) is the collective term for the fibrous membranes that envelop the brain and spinal cord, providing protection to the delicate tissues of the central nervous system. In mammals, the meninges is a group of three membranes: The dura mater, the arachnoid mater, and the pia mater, with the dura mater the outermost layer and the pia mater the innermost layer. In other animals, there may be one or two layers. The term meninx, which is Greek for "membrane," refers in general to a membrane, but especially to one of the three membranes. These three layers also may be referred to more simply as just the dura, arachnoid, and pia. The primary functions of the meninges and of the cerebrospinal fluid (produced in and circulating in the meninges) is to protect, cushion, nourish, and support the brain and spinal cord. Indeed, the term mater is Latin for "mother," and refers to the protective and nourishing function of these three layers. Diagrammatic representation of a section across the top of the skull. 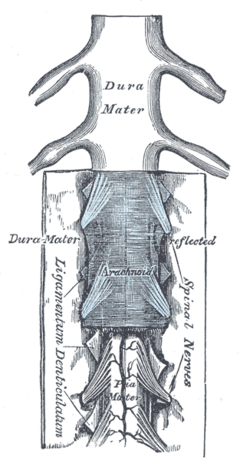 The medulla spinalis and its membranes. 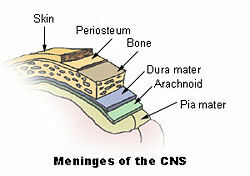 All the meninges are composed of connective tissue. The meninges are composed of the pia mater (inner layer), arachnoid (middle layer), and dura mater (outer layer). The meninges also can be classified according tot he portion that covers the brain (dura mater cerebir, dura mater encephali, arachnoidea encephali, and so on) or that part lining the spinal cord (pia mater spinalis; arachnoidea spinalis, and so on) (Polzin 2005). The pia or pia mater is the thin, mesh-like meningeal envelope that is directly in contact with the neural tissue, firmly adhering to the surface of the brain and spinal cord. It is a very thin and delicate membrane. The word pia in Latin means "soft" or "tender" and thus pia matter essentially means "tender mother." It is composed of fibrous tissue covered on its outer surface by a sheet of flat cells thought to be impermeable to fluid. The pia mater is pierced by tiny blood vessels, which travel to the brain and spinal cord, and its capillaries are responsible for nourishing the brain. The pia mater follows all the contours (grooves, folds, and fissures) of the brain (gyri and sulci). It closely envelops the entire surface of the brain, running down into the fissures of the cortex. It joins with the ependyma, which lines the ventricles to form choroid plexuses that produce cerebrospinal fluid. In the spinal cord, the pia mater attaches to the dura mater by the denticular ligaments through the arachnoid membrane. The pia mater is a neural crest derivative. The middle element of the meninges is the arachnoid mater, interposed between the more superficial dura mater and the deeper pia mater. Arachnoid means "spidery" and is named because of the membrane's spider web-like appearance and consistency. While mater technically does not belong with the arachnoid layer, and sometimes this layer is only referred to as the arachnoid (Polzin 2005), the term arachnoid mater has nevertheless been adopted for uniformity with the other meninges, and "arachnoid mater" is currently the Terminologia Anatomica international standard. The arachnoid mater exists as a thin, transparent membrane. It is composed of fibrous tissue and, like the pia mater, is covered by flat cells also thought to be impermeable to fluid. The arachnoid does not follow the convolutions of the surface of the brain and so looks like a loosely fitting sac. It is attached to the inside of the dura, surrounds the brain and spinal cord, but does not line the brain down into its sulci (folds). The arachnoid mater is separated from the pia mater by the subarachnoid space. This space between the arachnoid membrane and the pia mater includes many fibrous filaments and blood vessels. In the region of the brain, particularly, a large number of fine filaments called arachnoid trabeculae pass from the arachnoid through the subarachnoid space to blend with the tissue of the pia mater. Cerebrospinal fluid flows under this membrane in the subarachnoid space. The arachnoid and pia mater are sometimes considered as a single structure, the leptomeninx, or the plural version, leptomeninges. Similarly, the dura in this situation is called the pachymeninx. The dura mater is a thick, durable membrane, closest to the skull. Dura is the Latin word for "hard<" and thus dura mater refers to "hard mother," reflecting that it is the tough and inflexible of the three layers. This outermost area adheres to the skull, while the inner surface is loosely connected to the arachnoid layer; however, there is an exception in terms of the spinal canal, where there typically is a thin fat layer and network of blood vessels between the bony part of the vertebrae and the dura (Polzin 2005). The dura mater consists of two layers. 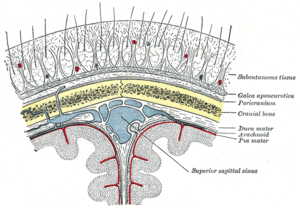 There is an outer, periosteal layer, rich in blood vessels and nerves, and an inner meningeal layer, which is attached to the arachnoid (Scaravelli 2001). The inner surface is covered by flattened cells like those present on the surfaces of the pia mater and arachnoid. The two layers of dura mater run together throughout most of the skull. In some areas within the skull, these two layers are separated, allowing channels for blood draining from the brain into veins (Scaravelli 2001). Where they separate, the gap between them is called a dural venous sinus. These sinuses drain blood and cerebrospinal fluid from the brain and empty into the internal jugular vein. They drain via the arachnoid villi, which are outgrowths of the arachnoid mater that extends into the venous sinuses. These villi act as one-way valves. Meningeal veins, which course through the dura mater, and bridging veins, which drain the underlying neural tissue and puncture the dura mater, empty into these dural sinuses. The dura also extends into membranes dividing the cranial cavity into compartments (Scaravelli 2001). The dura separates into two layers at dural reflections, places where the inner dural layer is reflected as sheet-like protrusions into the cranial cavity. There are two main dural reflections. The tentorium cerebelli exists between and separates the cerebellum and brainstem from the occipital lobes of the cerebrum (Shepherd 2004). The falx cerebri, which separates the two hemispheres of the brain, is located in the longitudinal cerebral fissure between the hemispheres (Vinas and Pilitsis 2006). Normally, the dura mater is attached to the skull, or to the bones of the vertebral canal in the spinal cord. The arachnoid is attached to the dura mater, and the pia mater is attached to the central nervous system tissue. Typically, there is not space between the dura mater and the skull on one side, nor between the dura mater and the arachnoid on the other. However, abnormal conditions, such as illness or injury, can create spaces there. Any space created between the dura and the skull is called epidural (above the dura) and when the dura mater and the arachnoid separate, the space between them is considered subdural (below the dura) (Polzin 2005). As mentioned above, there is normally an actual space existing between the arachnoid and the pia mater, known as the subarachnoid space. It contains many fibrous elements (trabeculae) and it is filled with the circulating cerebrospinal fluid. The meninges provide mechanical protection, support, and nourishment. The dura mater is a sac that envelops the arachnoid and has been modified to serve several functions. It surrounds and supports the large venous channels (dural sinuses) carrying blood from the brain toward the heart. It provides a line of defense for the brain and its flexibility means that most skull fractures will not result in loss of cerebrospinal fluid (Polzin 2005). The arachnoid membrane provides a space through which the cerebrospinal fluid can circulate, and this layer of fluid helps to cushion the brain and protect it from sudden impacts and movements (Polzin 2005). It also provides specialized tissue for absorption of the cerebrospinal fluid back into the bloodstream and the arachnoid trabeculae help to anchor the surrounding membranes and keep the subarachnoid space open to the proper depth (Polzin 2005). The pia mater helps protect the brain and spinal neurons from direct contact with the cerebrospinal fluid, while providing an area for the blood vessels, from the dura matter and through the subarachnoid space, to enter the central nervous system for nourishment (Polzin 2005). 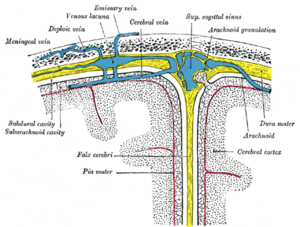 The cerebrospinal fluid may be thought of as a fourth layer of the meninges, being produced in, circulating in, and reabsorbed by the meningeal layers (Polzin 2005). Among medical conditions that affect the meninges are meningitis (inflammation of the meninges, usually from fungal, bacterial, or viral infection) and meningiomas arising from the meninges or from tumors formed elsewhere in the body, which metastasize to the meninges. A subdural hematoma is a hematoma (collection of blood) located in a separation of the arachnoid from the dura mater. The small veins that connect the dura mater and the arachnoid are torn, usually during an accident, and blood can leak into this area. An epidural hematoma is a collection of blood between the dura and the inner surface of the skull, and is usually due to arterial bleeding. It may arise after an accident or spontaneously. Dural ectasia is the enlargement of the dura and is common in connective tissue disorders, such as Marfan Syndrome and Ehlers-Danlos Syndrome. Crippen, D.W., and S. Shepard. 2008. Head trauma. Emedicine.com. Retrieved September 24, 2008. Orlando Regional Healthcare, Education and Development. 2004. Overview of adult traumatic brain injuries. Retrieved on September 24, 2008. Polzin, S. J. 2005. Meninges. In S. L. Chamberlin, and B. Narins. 2005. The Gale Encyclopedia of Neurological Disorders. Detroit: Thomson Gale. ISBN 078769150X. Scaravelli, F. 2001. Meninges. In C. Blakemore, and S. Jennett. 2001. The Oxford Companion to the Body. New York: Oxford University Press. ISBN 019852403X. Vinas, F. C., and J. Pilitsis. 2006. Penetrating head trauma. Emedicine.com. Retrieved September 24, 2008. This page was last modified on 26 September 2008, at 15:57.